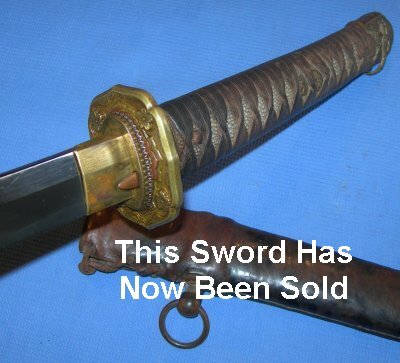 A superb authentic gendaito, full early mounts, unsigned blade, partial rust damage. This is a superb authentic Gendaito (traditionally forged blade) katana in early WW2 shin gunto mounts (seppa etc. all numbered "T17"), the 27 inch blade is lovely compared with most WW2 era blades (it is slender, elegant and exceptionally well made). The good news is that this fine shin gunto can be yours for only £800. The bad news is, there is some damage, though a proper "polish" (approximate cost £400) would I believe cure this and leave you with one of the nicest shin guntos you will ever find. Truly, if I weren't so busy with so many things in the air right now, I would have the polish done myself and then offer this sword at £2500. The majority of the blade is in very good order. As you can see, there is both nie and nioi to the yakiba (the gonome type hamon has tiny flecks and a white cloudy lining), plus their is a clear masame hada (straightish graining to the blade). These tell you the blade is traditionally made, and it was made exceptionally well. Regrettable the sword was not stored very well and areas near the tip have suffered from moisture exposure; there is a small amount of slight pitting but not much, it is mostly "patina"; the very tip is also broken off. Again, a good polish should restore this blade to its former full glory. The tang has also suffered with rust (no big deal) but is still sound. The quality of the blade is such I initially believed it was an older blade, but the single peg hole indicates it was made and only ever mounted in its shin gunto mounts. This was the hardest ever shin gunto to get apart because of the tang rust. But it is clear, there was never a signature or date on the tang, and certainly never a Seki stamp; some Japanese officer or his family paid very good money for this sword. With a full 8 seppa (spacers) and large rayskin nodule same, plus a very substantial (heavy) steel in leather saya / scabbard, this shin gunto really does stand out against the crowd. My earnest advice is to take this sword and run; it is incredibly good value. I then would earnestly and forthrightly recommend you get it polished by someone in the UK I know (Tony Norman) who has done excellent work for me in the past. It may be a few months before he can do it (he is very popular and busy), but I am 100% sure you would double what you paid for it in total investment and enjoyment wise. My item number is 797 - Box TBA. Please ask for full sized / additional photos.